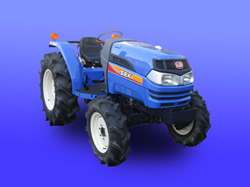 ISEKI AT tractors are tough and intelligent machines for new generation. Their high performance and reliability bring benefit to the field work. The completely new design is stylish and impressive. AT series have an extraordinarily efficient 3- or 4-cylinders water-cooled diesel engine. All engines generate strong power for any applications. 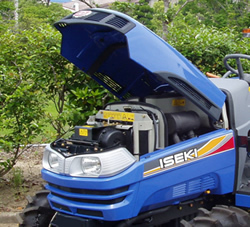 Thanks to flip-up engine bonnet, operator can reach engine room easily for daily maintenance. Dual Element Air cleaner always deliver clean air to the engine, AT series can work all day continuously even under hard conditions. Big Fuel Tank supports the operator to work longer without fuel charge. Automobile type instrument panel gives a clear view of all important information about tractor condition. 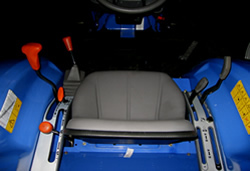 Ergonomic designed operator space provides Effective and comfortable work. Control levers are located nearer to the operator side to contribute efficient work and to reduce operator's fatigue even for long operation. Wide and flat floor provides enough space for opeator. AT series adopt floating floor which floats from drive train with rubber mount. This low vibration floor contributes excellent comfort to the operator and enable them to enjoy full day working.